The Advocacy Agenda of People Living with NCDs was built with the generous input of 1,893 people living with NCDs who took part in the Our Views, Our Voices consultation efforts. It provides a compass for NCD advocacy efforts and functions as a living document that captures the priorities of people living with NCDs. It is intended to guide and support efforts of key stakeholders to improve NCD prevention and control. Click here to read more! Click on the image below to download the Agenda. This Advocacy Agenda of PLWNCDs in Mexico is the result of broad consultative processes during 2017 and 2018 involving dozens of people living with NCDs in Mexico City, representing diverse conditions, along with multiple stakeholders engaged in the NCD response in the country. 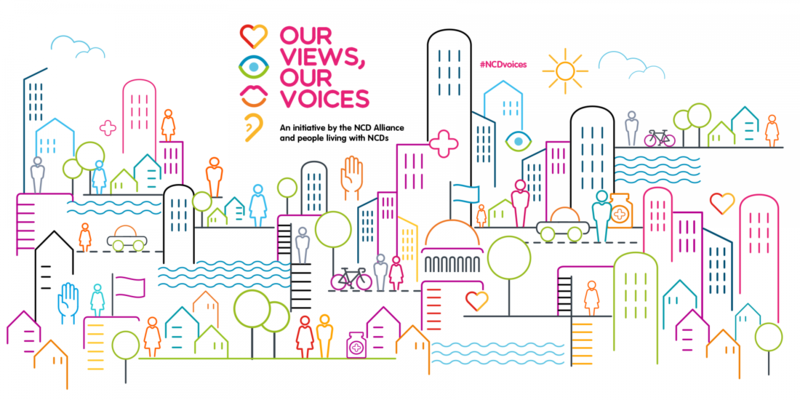 The NCD Alliance is conducting an online consultation under its Our Views Our Voices initiative to gather experiences and priorities of people living with NCDs ahead of the UN HLM on UHC. The Advocacy Agenda of People Living with NCDs in Kenya is the result of a two-day consultative process involving the voices of 52 people living with NCDs, representing diverse conditions along with over 50 diverse stakeholders engaged in the NCD response in Kenya. This review lays out some definitions of key concepts & explores what meaningful involvement of people living with NCDs currently looks like within CSOs, government & health care delivery. This review by NCDA lays out some definitions of key concepts and explores what meaningful involvement of people living with NCDs currently looks like within Civil Society, Government, and Health Care Delivery.